Congratulations, you’ve got the grades, had a relaxing summer, and it’s now time to embark on your exciting new adventure – university! We think whoever came up with the saying ‘school days are the best days of your life’ was probably referring to uni, and right away you’re sure to embrace your independence, chosen subject, and of course, the social side! Before you even start university, you’ll have to consider what to bring, and how you’ll fit all your stuff into your new room. But fear not, we’re here to help! When it comes to uni, we’ve been there, got the student union t-shirt and written the book… well, dissertation anyway! What should you bring to uni? Several pots and pans or a wok – most things can be cooked in a wok! If you’re living in shared accommodation, don’t bring too much as otherwise you may end up with six toasters in your kitchen! You could always wait until you’ve moved in, and scope out what you’ll need to buy. 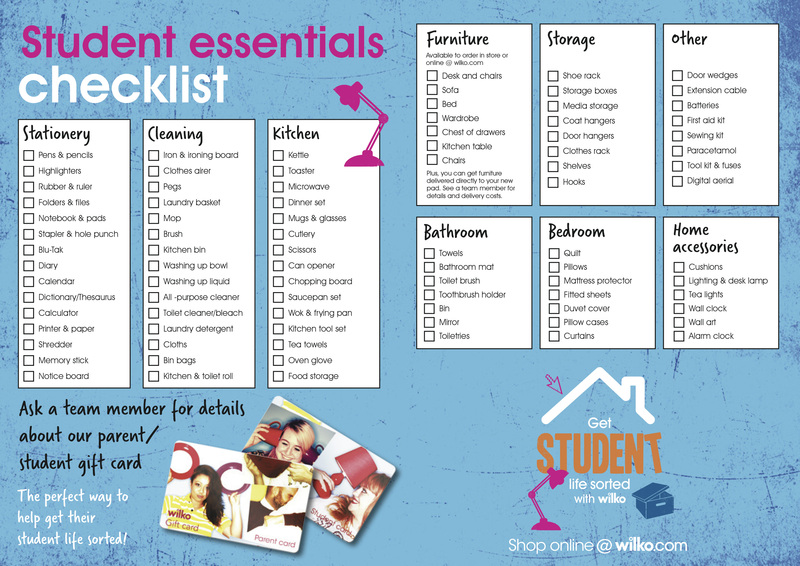 And when you’re in, check out our student essentials checklist, which includes everything you’ll need for your first year. Don’t worry if you forget anything, most universities have plenty of shops nearby for anything you’ve missed – and these days of course, it’s simple to buy things online, even food. Unfortunately we can’t come over and help you pack, but we can provide some handy packing tips and storage solutions for your new pad! If you’re moving far from home you may want to bring a variety of clothes, including warmer winter clothes that you won’t need just yet. To store these away without taking up too much space, check out our vacuum sealed storage bags. They’ll create four times more storage space in your room, whilst protecting packed items against mites, moisture and dust. Click here to see all our clothes storage solutions, including rails to keep your garments looking fresh! To keep your shoes from getting squashed, check out our plastic shoe boxes available in small and large sizes – they’re great for packing, and for storage when you’ve moved. You could even check out the JML Shoes Under, a space saving shoe organiser that slides under your bed to keep your room nice and neat. If you’d prefer to store them in your wardrobe, our shoe organiser is ideal. You won’t have anyone nagging you to keep your room tidy, but if you decide to keep it clean, we’ve got everything you need. Our plastic drawer set is lightweight, with 17cm deep drawers and mini legs making it great for all your bits and bobs. For a completely flexible storage solution, why not check out our stackable storage range? It’s available in 9 sizes ranging from 5.6 litre to 90 litre and is designed to stack on top of each other therefore taking up less floor space. They’ll provide a great moving and space saving solution for anything from books and stationery to DVDs and bedding. Most rooms have desks included, and if you want to keep it looking clutter free take a look at our stylish rose gold magazine holder and matching desk tidy, or click here to check out all our desk storage solutions. Whether you’re lucky enough to have an en-suite in your room or are sharing with a large group, bathroom storage is always handy. We’ve got a variety of storage solutions including a floor tidy, under basin tidy and hanging shower caddy. For something a bit different, take a look at our versatile drawer unit.